How do you match Ed Brubaker's astonishing run on Captain America? By making the first story arc of the Marvel NOW! series a far-out story pitting Captain against a crazy Nazi scientist in a dimension of his own making. Things continue to race towards the conclusion as not only does Cap have to rescue his adopted son from a fortress full of crazy mutants, but he's also got to stop Arnim Zola from infecting the Earth with a virus that implants the consciousness of Arnim Zola in the victims. 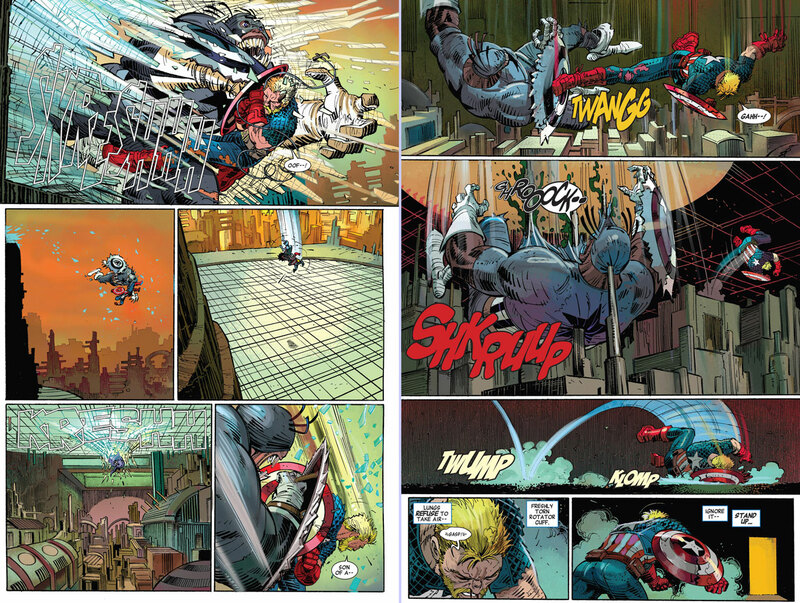 Remender's been firing on all cylinders, and JR Jr. is showing why he's a big name in comics. His flaws are still present and rear their head occasionally during slow scenes, which is a small price to pay to see him masterfully draw grandiose settings and stunning action scenes. From the very beginning this has been one of my favorite Captain America stories, so I can't wait to see how it finishes up. An illuminati of the world's heroes continue to delve into the mysteries of "the wheel" as they attempt to halt the destruction of their world. Some of them also continue to question the morality of their actions. Interesting things occur, things that I like. That said, the comic is still trending in the "2deep4u" direction, which is a tough and perilous path to trod. While the comic isn't for everyone, nor Hickman's best work, it is certainly something that keeps me intrigued and coming back for more. This issue proves to be a good jumping on point for new readers as it manages to take a few of the ongoing plot threads and weave them into a single cohesive story. In that sense, it's a comic all about setting up the coming conflict between Wolverine's Jean Grey School and the Hellfire Academy. Wolverine vs. Hellfire (insert establishment here) is certainly a comic that I will be buying. Nothing particularly stands out, but the previously mentioned convergence of plot points is a hallmark of X-Men comics and their ensemble cast. This is a collection of three digital first stories. First up is Parker and Samnee's little episode of Superman taking on a guy tweaking on super meth. The plot and story are well done, but the best part is definitely Samnee's art. He brings the Daredevil awesomeness along with him. -"So? It doesn't matter if he's more powerful or not. I still get to win!" The final story involves Superman trying to stop Bizarro. Eventually it turns out it's all a big misunderstanding, since Bizarro says the opposite of what he means. Superman helps Bizarro help people and the crisis is averted. The entire comic, all three stories, is a comic for everybody. Those that already like Superman should greatly enjoy how the man of steel is portrayed. Those that don't necessarily get or like Superman would probably acquire a better understanding for the last son of Krypton and all he stands for. Part of what he stands for is hope, something this book is full of. Few things are as near and dear to me as G.I. Joe, so it pains me to admit that I've been a bit lax with keeping up with the exploits of America's daring, highly-trained special mission force. That changes now with the latest volume of the comic. The Joes are currently on a mission to take back a Cobra controlled town. Things don't go well, but man is it a good comic. The action is well thought out and executed very nicely. Small comedic touches enhance the dire stakes, which in turn builds on the overall intensity of the tone. Fred Van Lente's work on Incredible Hercules is a modern masterpiece, and he is a natural fit for the G.I. Joe franchise. Despite a few stumbles with background/crowd art this comic has reignited my love for these real American heroes.